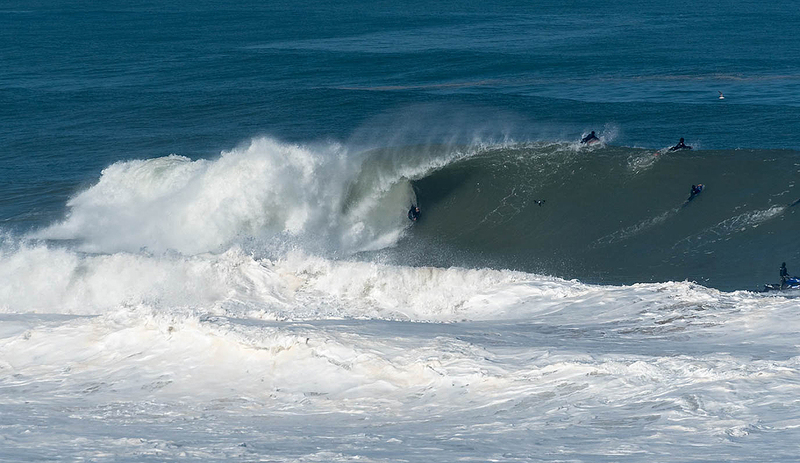 This wave looks like a mix of Pipeline with Teahupo, but it’s in Portugal. The great swell that struck the Portuguese coast this April brought epic waves and surprised many people. And while Nazaré was lit up by the same swell, one group of surfers and bodyboarders converged on this place. It’s a demanding wave that definitely isn’t for everyone. Very technical and heavy, it’s not a coincidence that it’s frequented almost exclusively by professionals and experts. Among them on this day were João de Macedo, António Cardoso, Pierre Louis Costes, Nic Von Rupp, Luís ‘Porkinho’ Pereira, Miguel Blanco, Ricardo Guedes, João André, Tiago Fazendeiro, Ricardo Faustino, Bogdan Goleminov, Vasco Tonel, Rodrigo Carrajola, Guilherme Fonseca and Hugo Pinheiro. For safety, the group had the support of the experienced jet ski pilot Sergio Cosme.